Feeling down about dying polar bears, deforestation and the state of the world in general? 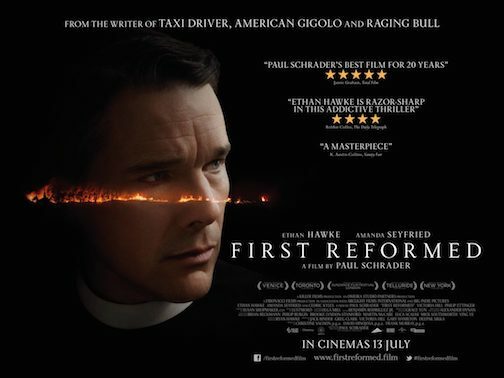 Paul Schrader’s beautiful, bruising “First Reformed” is the movie for you. Ethan Hawke is superb as Toller, an ex–military chaplain reckoning with a painful past. He’s been made the pastor of a tiny, historic church in upstate New York, which should be a balm for him. But even though he spends his days trying hard to do the Lord’s work – extending particular kindness to an anxious young wife and mother-to-be, played with tremulous sensitivity by Amanda Seyfried – his nights become intense sessions of journal keeping and destructive drinking. With “First Reformed,” Schrader, best known as the writer of “Taxi Driver,” a director he’s given us his share of terrific, sometimes underappreciated pictures like “Forever Mine” and “Patty Hearst” – has made a fine existential-crisis movie. And for all its serious intent, it isn’t torture to watch. Part of the movie’s understated triumph lies in its casting: Hawke is an actor who clearly cares, and worries, a lot–the tree of life is practically etched into his forehead. As the hyper-conscientious Toller, he conveys both the selfishness and the true anguish of people who just can’t let go of their own pain. But he also offers a shred of hope in the idea that in the end, caring too much might be just the thing that saves us.